When the estate's assets are not sufficient to pay debts, the executor may need to petition the superior court where the estate is open to obtain an order to sell the decedent's real property. In North Carolina, title to real property vests in the decedent's heirs upon death, and a special proceeding is required to bring the property into the estate. The beneficiary and executor's deed is an instrument executed by a decedent's heirs and joined by the executor of the decedent's will to convey an interest in real property from a testate estate (so called when the decedent leaves a will) to a purchaser. When the estate is still open in probate, the executor joins in the deed consenting to the sale of the real property described within as required by N.C.G.S. 28A-17-12. By signing the deed, the executor waives the possibility of opening a special proceeding to bring the property back into the estate later. Unless a) the decedent wills the realty to the executor or directs to the executor to sell the realty with only the proceeds of the sale directed to devisees, or b) the will confers a power of sale upon the executor and devises the property to the estate (and not a devisee), heirs must execute the deed for a valid transfer. Because title is legally vested in them, the executing heirs may make warranties of title, but the executor typically does not. Any warranty language included in the deed is binding on the heirs. Recitals of a beneficiary and executor's deed include a statement that the decedent died testate and information regarding the probated will, including the date of death, the county of probate, and the file number assigned to the decedent's estate by the clerk of superior court. In addition, the deed contains statements that the executor named within was appointed by the decedent's will and is duly qualified to administer the estate; that a notice to creditors has been given and the estate is still open; and that the executor joins to evidence consent to the sale. 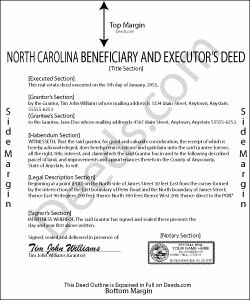 A lawful deed in North Carolina states the consideration made for the transfer of title, contains an accurate legal description of the subject parcel, recites the grantor's source of title, and indicates whether the property conveyed comprises any part of the primary residence of the grantor. When properly executed and recorded, the beneficiary and executor's deed vests title to the within-described property in the named grantee(s). For a valid beneficiary and executor's deed, the signatures of heirs and their spouses must be present to release homestead rights. Any restrictions to the transfer should be noted in the body of the deed. Both the heirs' signatures and the executor's signature must be acknowledged in the presence of a notarial official before the deed can be recorded in the county where the subject property is located. An affidavit of consideration or value is required for deeds recorded in Currituck County. Consult an attorney licensed in the State of North Carolina with questions regarding beneficiary and executor's deeds, as each situation is unique.